Item # 299854 Stash Points: 3,499 (?) This is the number of points you get in The Zumiez Stash for purchasing this item. Stash points are redeemable for exclusive rewards only available to Zumiez Stash members. To redeem your points check out the rewards catalog on thestash.zumiez.com. Never have numb fingers again thanks to the Dakine Fillmore Black Snowboard Mittens. These mid-weight mittens come in at a 3/5 warmth rating from the manufacturer but maintain a low profile fit to maximize dexterity. Fleece lined for comfort, these gloves also come with nose wipes built into the thumbs. 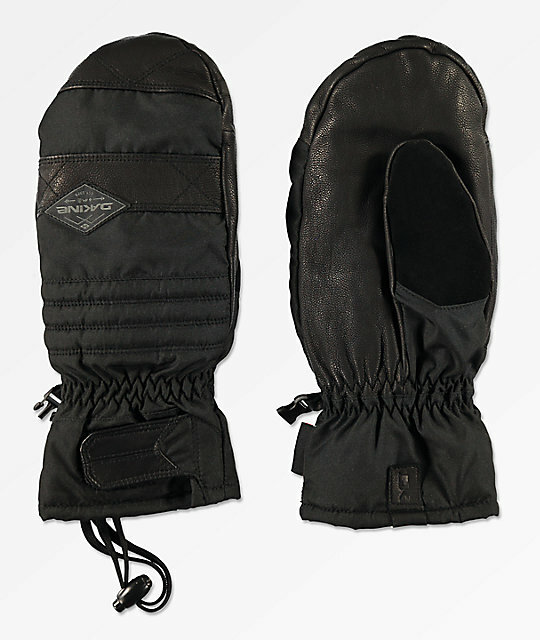 Keep your hands endlessly warm this winter in the Dakine Fillmore Black Snowboard Mittens. Fillmore Black Snowboard Mittens from Dakine. Leather Palm: Tough leather with ample waterproofing. High Loft Synthetic Insulation: [60 - 170g] A low-profile and lightweight insulation that resists moisture in wet conditions while trapping in heat. Dakine Warmth Index: 3 out of 5. Hook & loop adjustable cuff closure.